Located at Bourne Mills, Brimscombe, GL5 2TA . We look forward to seeing you there. Yuri is trained to internationally recognised ITEC Diploma Level 4. 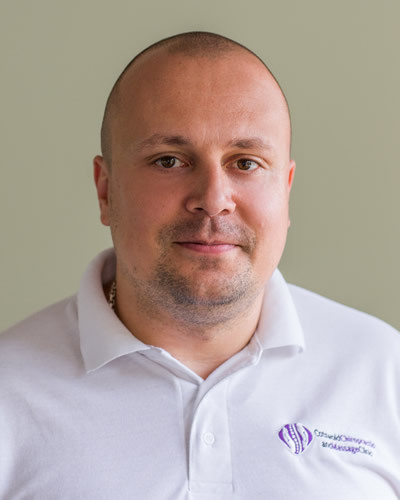 He has worked as a Massage Therapist for seventeen years in his native Slovakia, the UK, and across Europe. Yuri provides sports massage treatments for pre-, post- and inter-event maintenance and restorative purposes. He uses a range of massage techniques, focusing on treating dysfunctional tissue, and excludes working on recent acute injuries or pre-existing conditions. Yuri has experience of working with athletes of all kinds, including volleyball players, boxers, runners, triathletes and skiers. He is also fully qualified in Swedish Massage and offers holistic/relaxation massage. In his spare, time Yuri enjoys fitness, boxing and running. I suffer from a stiff neck and shoulder pain mainly because of years sitting at a computer and not moving my body as it’s meant to move; also there is an age issue here (58). Dave has eased the stiffness and taken some of the pain away already after only 2 sessions. He is attentive and helps me to feel comfortable and at ease with the process. I have been visiting Claire regularly for 4 years now to help me effectively manage my Fibromyalgia Syndrome. My pain levels and muscle soreness have been reduced, and my energy levels significantly increased. I have also experienced debilitating episodes of Hemiplegic Migraine but with Claire's gentle 'needling' technique I am very happy to say I have been clear for 3 years now. Claire is a true professional and takes time needed to get to know her patients as individuals thus treating them accordingly. I visited Claire with severe crippling back pain being 18 weeks pregnant. I found my treatment very professional, time was taken to talk, the cause of my problem was identified and sorted. Friendly, helpful and a very calm environment. Never rushed and consideration for baby and myself at all times. So glad to have someone I can call on if it happens again. Dave's skill in massage therapy, pin-pointing the exact area of muscular pain and tension in my leg, resulted in blessed relief, and after a few treatments I was running again. He is friendly and fun, taking one's mind off the pain as he works......and I didn't even need to take the car out of the drive. A great service! I initially sought Chiropractic care over 15 years ago for back and neck pain and Claire has very successfully treated me for the last 8 years. I can confidently say that she is by far the best Chiropractor that I have ever seen. My back used to regularly sieze or go into spasms but this rarely happens now and I believe it is because of the excellent treatment that I receive from Claire. She is gentle and effective, and I have no hesitation in recommending her treatment. Thank you once again for a wonderful massage. It is always a great way to relax as you are so thorough. The pressure is always spot on. Helps me cope with the week ahead. Many thanks. As you know I have a muscular condition but after your very careful massages all my aches and pains are spirited away. I always look forward to my next one and the relief it gives me. You are very thorough with your questions and have totally taken on board my illness and the restrictions necessary. Thankyou. I work at a computer and often suffer from neck and back discomfort. Having treatment right here in my office was the ultimate in convenience, even luxury, and several colleagues have now signed up for Dave's time-efficient and effective therapy.